The epic adventure Thor spans the Marvel universe from present-day Earth to the cosmic realm of Asgard ... At the center of the story is The Mighty Thor, a powerful but arrogant warrior whose reckless actions reignite an ancient war. As a result, Thor is banished to Earth where he is forced to live among humans. When the most dangerous villain of his world sends its darkest forces to invade Earth, Thor learns what it takes to be a true hero. $65.723 million on 3955 screens. Question of the day: would 2011’s Thor have been made without the need to introduce the character for 2012’s Avengers? Answer: I think it’s 50/50. Thor was usually viewed as a second-tier superhero anyway, and without the push toward Avengers, he may’ve stayed on the shelf. Nonetheless, Thor made it onto cinemas worldwide, and it did pretty well. With a US gross of $181 million, it paled in comparison with the $300 million-plus made by both 2008’s Iron Man and 2010’s Iron Man 2, but it compared favorably with the $176 of 2011’s Captain America. And it was sufficient to lead to a sequel, 2013’s Thor: The Dark World. In the realm of Asgard, the people enjoy an uneasy détente with the Frost Giants. When a few Giants disrupt the ceremony intended to promote Thor (Chris Hemstreet) to the throne held by his father Odin (Anthony Hopkins), the younger god wants to strike at them. However, Odin feels this is just the action of a rogue group and not worth massive attention. Thor decides to take matters into his own hands. He leads a group to attack the Giants and they nearly lose, but Odin intervenes and halts the battle. He brings back the warriors to Asgard and gets into a confrontation with Thor, who Odin believes showed himself to be unworthy of his exalted status. With that, Odin banishes Thor to Earth, where he ends up in the remote New Mexico desert. He encounters a team led by scientist Jane Foster (Natalie Portman) and tussles with them. A taser takes down the disoriented – and now mortal - Thor but eventually, the god and Jane develop a relationship. He’ll have to find a way to deal with his brother Loki (Tom Hiddleston) as the sibling tries to usurp Odin and also sends evil forces toward Earth. Looking back on my days as a comic book buff, Thor was never one of my favorite titles. I bought it and liked it okay, but I’ve simply never been a fan of any form of mythology, so that kept me distanced from the franchise. Because of that, I looked forward to this film less than I did the Iron Man flicks or Captain America. I saw it because I like the genre, but I couldn’t say I anticipated much from it. I can’t say I found Thor to greatly exceed expectations, but it does entertain a bit better than I’d figured it would. Of all the Marvel flicks, Thor alters the comic’s “origin story” the most. It doesn’t totally redo the character’s roots – obviously the mythological elements stay in place – but it abandons Thor’s alter ego of crippled Dr. Donald Blake – and recasts Nurse Jane Foster as a scientist. I’m a little disappointed that the movie takes so many liberties, but when viewed on its own merits, it works fairly well. Probably the main negative from the story stems from the “tail wagging the dog” way that Avengers starts to dominate these films. 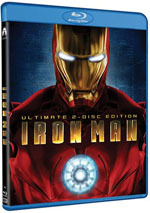 After the first Iron Man, the subsequent efforts occasionally feel like they exist largely to connect to Avengers rather than to stand as narratives in their own right. But that’s not a serious flaw, and much of Thor fares pretty nicely. Hemsworth brings the right approach to the lead role, as he boasts the character’s arrogance but manages the heroic side as well, and he handles some subtle comedy well. Portman can be stiff and mannered in other parts, but she seems loose and engaging as Thor’s putative love interest. Given the way the comics could tend toward the self-serious, I was happy to see the light comedy on display here. These elements don’t feel self-conscious, as they fit the rest of the film well and add some levity to the often somber material. Unlike the excessively jokey Iron Man 2, Thor comes across as natural and maintains a positive balance. Does any of this make me love Thor? No, I can’t say I think it’s a great film, but it’s more enjoyable than I feared it might be. With a fair amount of good action and a story that juggles a lot of balls well, it turns into a moderately satisfying adventure. 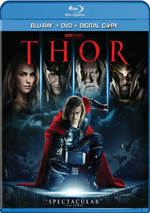 Thor appears in an aspect ratio of approximately 2.35:1 on this Blu-Ray Disc. Though not “demo quality”, this was a consistently positive presentation. For the most part, sharpness appeared strong. A smidgen of softness affected a few wide shots, but those were minor. Overall definition looked solid. I noticed no issues with shimmering or jagged edges, and edge haloes were absent. Source flaws failed to appear. As one might expect from a flick like this, Thor provided a stylized palette. Shots on Asgard went golden, while those on Jötunheim favored a chilly blue and Earth opted for an arid feel. All of these tints made sense and looked appropriate. Blacks showed good depth and darkness, while shadows were smooth. A few shots seemed slightly dense, but those occurred infrequently. I didn’t think highly enough of the image to merit “A”-level consideration, but I felt it was a solid “B+”. 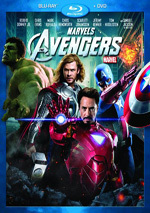 Comic book movies usually provide dynamic soundtracks, and that was the case with the DTS-HD MA 5.1 audio of Thor. With a variety of action and ambient elements, the audio brought the events to life in fine fashion. Battle sequences added the greatest punch, but the various bits connected to the plot contributed an involving sense of atmosphere. Of course, given the character’s nature, thunder was an important element, too. The pieces used all five speakers to good advantage. I especially liked the fight with the Frost Giants, as that sequence fleshed out the channels in an engrossing manner. Quieter scenes contributed good breadth and smoothness as well. All of this meant the audio filled out the spectrum in a nice manner. Plenty of extras occupy this set, and we open with an audio commentary from director Kenneth Branagh. He delivers a running, screen-specific look at story/character issues and connections with the comics, cast and performances, costumes and makeup, production design, sets and locations, music and editing, cinematography and effects, stunts and action, themes and tone, and the use of 3D. In other words, Branagh covers pretty much everything connected to the film’s creation. He does so with charm and verve, as he provides an engaging personality throughout the chat. From start to finish, Branagh delivers an excellent discussion of the movie. A new short film called Marvel One-Shot: The Consultant lasts three minutes, 57 seconds. It shows the background for the end scene from 2008’s Incredible Hulk. It offers a fun diversion. Under Featurettes, we find seven programs. These include “From Asgard to Earth” (19:57), “Our Fearless Leader” (3:18), “Assembling the Troupe” (4:44), “Hammer Time” (6:14), “Creating Laufey” (5:33), “Music of the Gods” (2:05) and “A Conversation” (2:23). Across these, we hear from Branagh, producers Kevin Feige and Craig Kyle, production designer Bo Welch, costume designer Alexandra Byrne, film character designer Ryan Meinerding, Thor/Loki character designer Charlie Wen, co-producer Victoria Alonso, art director Kasra Farahani, screenwriter Don Payne, property master Russell Bobbitt, comic co-creator Stan Lee, suit construction supervisor Shane P. Mahan, composer Patrick Doyle, comic book writer J. Michael Straczynski, and actors Anthony Hopkins, Chris Hemsworth, Tom Hiddleston, Jaimie Alexander, Ray Stevenson, Natalie Portman, Kat Dennings, Stellan Skarsgård, and Colm Feore. The featurettes cover set and production design, story/character areas, cast and performances, costumes and props, locations, Branagh’s work on the set, makeup and creature creation, music, and general thoughts. The pieces vary in quality, but as a whole, they bring us a fair amount of worthwhile info. Another piece called Road to the Avengers lasts two minutes, 57 seconds. It gives us some clips from the various Marvel films and some hints at Avengers. It’s basic promo stuff. 11 Deleted Scenes occupy a total of 24 minutes, 34 seconds. As often is the case, these tend to focus on supporting characters and/or extensions to existing sequences. We get a fair amount more in Asgard, and that helps expand Rene Russo’s “blink and you’ll miss her” turn as Frigga. We also see more of the Asgardian warriors on Earth and a few other minor elements. None of these would’ve been particularly useful in the final film, but they offer some entertaining moments. We can watch the deleted scenes with or without commentary from Branagh. He gives us some background about the clips and occasionally discusses why they failed to make the final cut. After his commentary for the film, I hoped Branagh would continue to provide great info here, but that doesn’t happen; he throws out brief notes for each scene but doesn’t flesh them out as well as expected. The disc finishes with three trailers. We find both the teaser and theatrical promos for Thor plus a clip for an animated Avengers program. 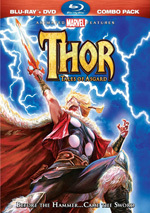 A second disc supplies a DVD Copy of Thor. This provides a bare-bones version of the film without extras. As someone who never was wild about the comic series, I didn’t expect much from Thor. While I can’t say the film dazzles, it does entertain and it brings the characters/situations to life in a fairly satisfying manner. The Blu-ray presents strong visuals, excellent audio and a nice set of bonus materials highlighted by a terrific commentary. Thor doesn’t make me a serious fan of the franchise, but I like it.